Special guest article from Joe Morris. Thanks for taking the time to get over to Uptown Market and do a great review of this new west side gem. Despite Portland’s well-deserved reputation as a craft brew and homebrewing hotbed, there has long existed a black hole on the west side of town. Deep Southwest Portland and Beaverton have been mostly under-serviced in terms of bottle shops, homebrew stores and premium watering holes. Frustrated beer geeks found themselves picking through grocery shelves for quality ales or making a trek to Multnomah Village for something more unique. 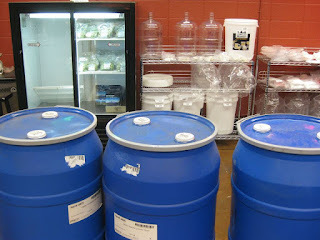 Meanwhile devoted homebrewers in the area traveled to Tigard and Hillsboro for brew supplies. Beaverton has been something of a desert island in a sea of quality beer... but now we’ve found a new oasis. 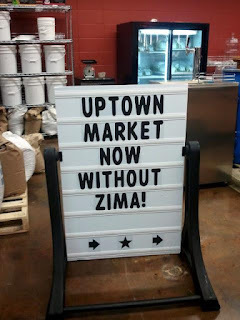 Uptown Market opened on December 10th, 2011 to quench the thirst of the teeming suburban masses. First conceived over four years ago by brothers AJ and Chris Shepard and college friend Stuart Faris, Uptown Market is a hand-in-glove fit for the locals in the area. The concept is simple.... So stunningly simple, it is surprising that there are not more shops like it. A combination bottle shop and local home brew store is a novel idea and it works fantastically. A shared love of craft beer originally inspired the trio to plan to open a bottle shop. As their interest in beer developed it naturally progressed into a love of homebrewing. In turn, this lead to the idea of combining the two concepts under one roof. Sitting around a table fashioned from a wine barrel, drinking a American pale ale brewed in one of their classes, I asked Stuart what he enjoys most about being involved in craft brew culture...“I just love getting people excited about beer.” And that statement seems to sum up the motivation of the three co-owners. They are enthusiastic about both beer and the local community and it is reflected in nearly everything they do. 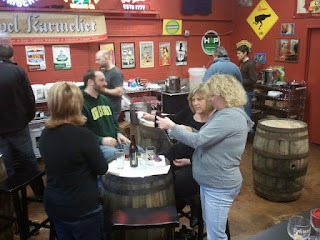 Uptown hosts tastings from local commercial breweries on Thursdays, Fridays and Saturdays. They teach beginning homebrew classes on Sundays (though they will teach classes on other days by appointment for large groups). I stepped into Uptown on a recent Friday night and the atmosphere was that of a party. Laurelwood was there, meeting customers and showcasing their wares. Uptown maintains 6 taps and a kegerator on which they rotate notable craft brews alongside their own homebrew. Customers often show up with bottles of their own creation to share. It is a great vibe and reflective of the culture the owners are building with their shop. Tasting events typically involve opportunities to meet professional brewers, other brewery reps and cop some free swag. However, on April 14th, Uptown is collaborating with Widmer Brothers Brewing to bring something truly special to their customers. Four local brewers will have an opportunity to not only meet the brewer, but brew Widmer’s famed Pitch Black IPA in-store on a homebrew scale. The four lucky brewers will be chosen in the coming weeks...details to follow. 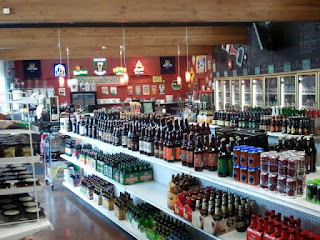 Thus far, the bottle side outpaces the brewstore side in terms of selection and variety, owed mostly to the dazzling array of bottles on hand. When asked to name a few truly unique bottles in the shop, the consensus was “pick a door,” as there is a show-stopper behind each of the fridge doors which line the back wall of the establishment. From Newberg’s Ninkasi Award winning homebrewer-turned-pro Paul Long’s cult favorite IPA to Xingu by FEMSA Cerveja Brasil, a Brazilian brewery that burns its own biomass to sustain operations, there is something special for even the most erudite beer geek. The homebrew side of the operation is up and running and has everything a beginning brewer (all-grain or extract) needs to get started. 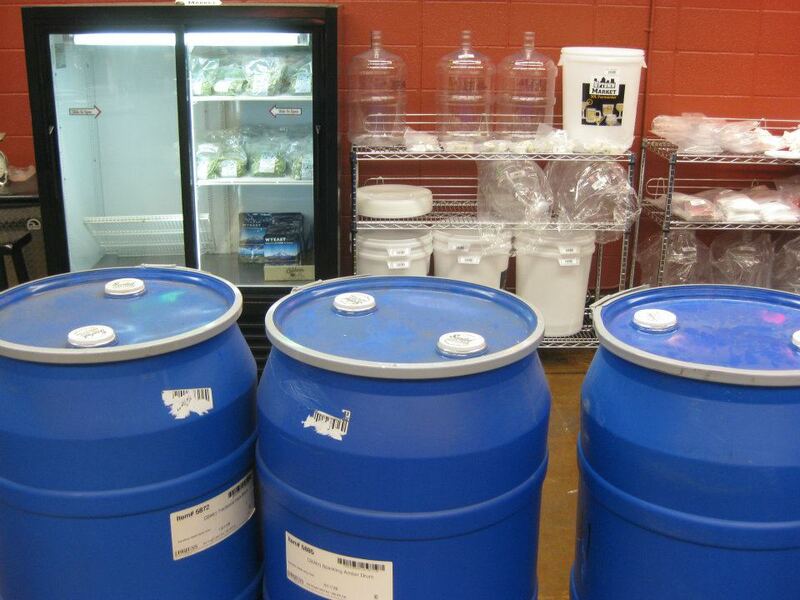 They carry bulk extract, base malts, specialty grains, hops and liquid yeast. Over the past few weeks, the shop has been rounding out the inventory to include more of the odds and ends that brewers need. There is plenty of square footage on the homebrew side that they hope to fill out and they are very receptive to customer requests for products and ideas. The hours Uptown keeps makes them unique among local homebrew stores. There is a moment of panic when a brewer has to complete a task and is missing a crucial piece of equipment. This moment of truth occurred for me after racking 5+ gallons of a big NW Red Ale to be bottled and discovered I was missing my bottling wand. I ran out the door and within 5 minutes, was able to purchase a replacement at about 9pm on a weeknight. That’s huge. To further encourage creativity and involve the local homebrew community, Uptown is sponsoring an Imperial IPA homebrew competition. Entries are to be judged on April 1 and in the spirit of that date, the rules are...there are no rules (other than fitting the BJCP style guide for IIPA). They are out-of-the-box thinkers and it seems that the open format of the competition will reward out-of-the-box brewers. 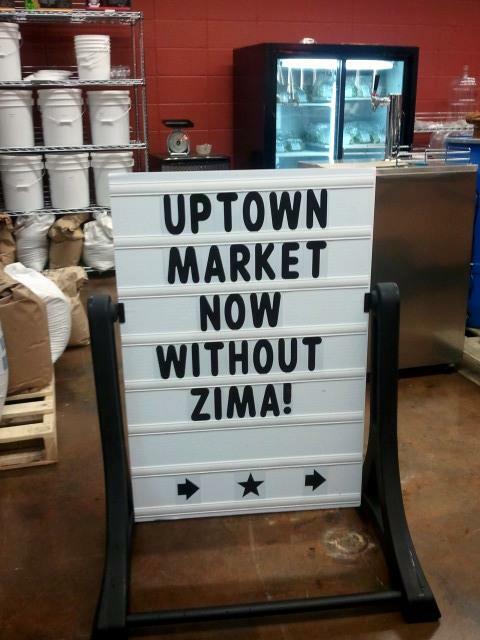 Uptown Market is located at 6620 SW Scholls Ferry Rd (near Allen) and is open seven days a week. I highly recommend stopping by to sharing a pint, meet the guys and geek out on beer.